A simple process to make sure your domains are set out how they should be. If you are a domain investors who has been investing for even a couple of years, your portfolio is probably a bit messy. By messy, I mean you have domains pointing to stale nameservers, some of your registrant information is wrong, etc. This happens when you buy and sell domains frequently and participate in expired domain auctions. It’s a good idea to periodically check your domains and fix any mistakes. These final weeks of 2018 are as good as time as any for a portfolio checkup. If you have your domains at GoDaddy, the best way to do this is to export a list of your domains. 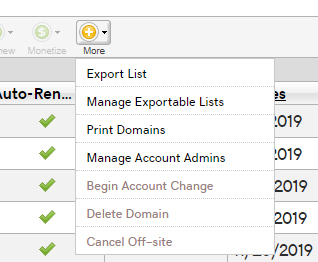 Users of the standard GoDaddy domain manager can do this by clicking “More” and choosing the first option to export list. Once you export your list into CSV you’ll be able to open it in Excel and look for anything you need to fix. I uncovered many domains with wrong nameservers on my recent portfolio checkup. Several pointed to defunct parking company servers. Others pointed to the forwarding servers of prior registrars. This could lead to lost sales opportunities. Portfolio checkups are trickier if you use multiple registrars. Watch My Domains Pro is a useful tool but can be trickier to use now that Whois records are obscured because of GDPR. You might need to use the API feature to download your data.